Full employment used to be an explicit goal of economic policy in most of the industrialized world. Some countries even achieved it. 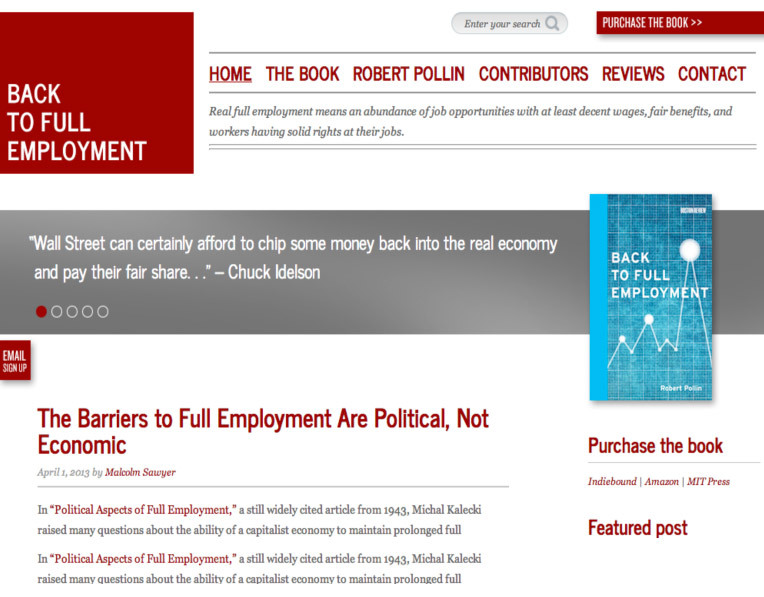 In Back to Full Employment, economist Robert Pollin argues that the United States--today faced with its highest level of unemployment since the Great Depression--should put full employment back on the agenda. There are good reasons to seek full employment, Pollin writes. Full employment will help individuals, families, and the economy as a whole, while promoting equality and social stability. Equally important, creating a full-employment economy can be joined effectively with two other fundamental policy aims: ending our dependence on fossil fuels and creating an economy powered by clean energy. Explaining views on full employment in macroeconomic theory from Marx to Keynes to Friedman, Pollin argues that the policy was abandoned in the United States in the 1970s for the wrong reasons, and he shows how it can be achieved today despite the serious challenges of inflation and globalization.